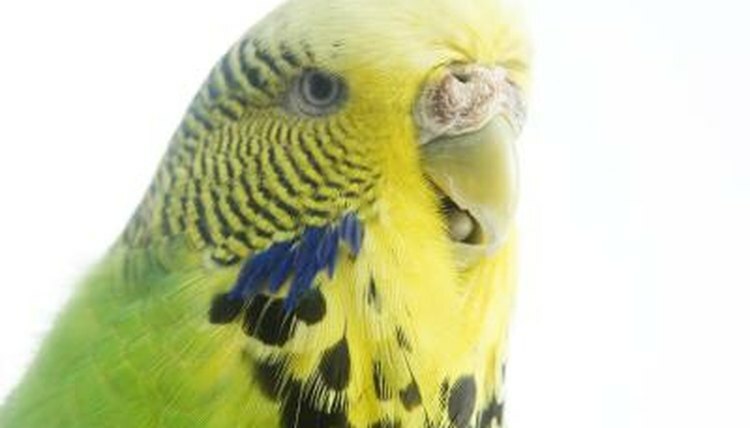 Parakeets, also known as budgies, are medium-size birds with extra large personalities. These highly social birds flourish when they have a cage mate, and enjoy a variety of perches and toys. Setting them up nicely doesn't have to break the bank, for with a little patience, the do-it-yourself aficionado can fashion a cage in his spare time. Cut seven panels of wire, 2 feet square, using the wire cutters. Connect two panels along one side with J-clips, using J-clip pliers. Space the J clips 2 inches apart for maximum stability. Lay the two panels flat and side-by-side, and attach the first to the second by running a single line of J-clips down the edge where the panels meet. Once the first and second panels are attached, stand them upright and perpendicular. Using the J-clips and pliers, attach the third panel to the side of one of the other two, forming the third side of a cube. Attach the fourth panel to the sides of the first and third panels with J-clips, creating a square box with no top bottom. Connect one remaining panel on the top, using the J-clips and pliers. Flip the cage upside down and secure the bottom panel with the J-clips and pliers. Cut an entry space in one side of the cage, 6 inches from the bottom, centered. The doorway should be at least 4 inches by 4 inches to allow you to easily insert your hand into the cage. Attach the right side of the door to the entryway opening, using J-clips and the pliers. Add a tension spring to the left side of the door. This will allow you to securely close the door. Cut three strips from the excess wire, 2 inches by 24 inches. Attach one of these small panels to the back of the cage at the bottom, horizontally. Attach the remaining two to both sides. This gives the bottom of the cage a 2-inch-high seat, open in the front, where you'll slide in the cage's false bottom. Secure the final 2-by-2-foot panel along the three sides of the false bottom, using J-clips and the pliers. Slide the tray into the false bottom you've just created. This will allow for easy cleanup of bird droppings.  If you don't have J-clip pliers and don't want to go to the expense of purchasing them, you can substitute electrical ties for J-clips. Tighten them securely to give the cage stability. Remove excess from the ties after you secure them to avoid having your parakeet indulge in a plastic snack. ⚠ Keep wire cutters away from children.